Lava continues to burn through vacant lands in the Kaohe Subdivision, heading northeast. (ABOVE VIDEO) Today’s Civil Defense message with video, photos and maps produced by USGS Hawaiian Volcano Observatory on Monday. PUNA, Hawaii – Lava continues to burn through vacant lands in the Kaohe Subdivision, heading northeast. It has gone 270 yards since yesterday, according to a morning message from Hawaii County Civil Defense. 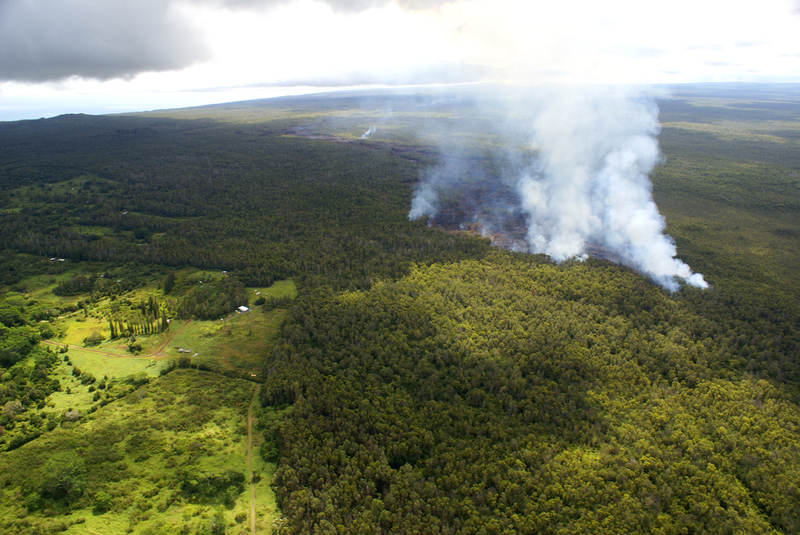 Presently the active edge of the surface flow is moving through the upper northwest corner of the Kaohe Homesteads and across a vacant forested parcel. The leading edge or front of the flow is approximately 100 yards wide. Currently the flow does not pose an immediate threat to area communities however residents of the Kaohe Subdivision are advised to continue to monitor the local radio broadcasts for further updates and for possible evacuation instructions if conditions change. Residents will be given adequate notice to safely evacuate should that be necessary. Civil Defense agency personnel will continue door to door notification in the Kaohe area today. 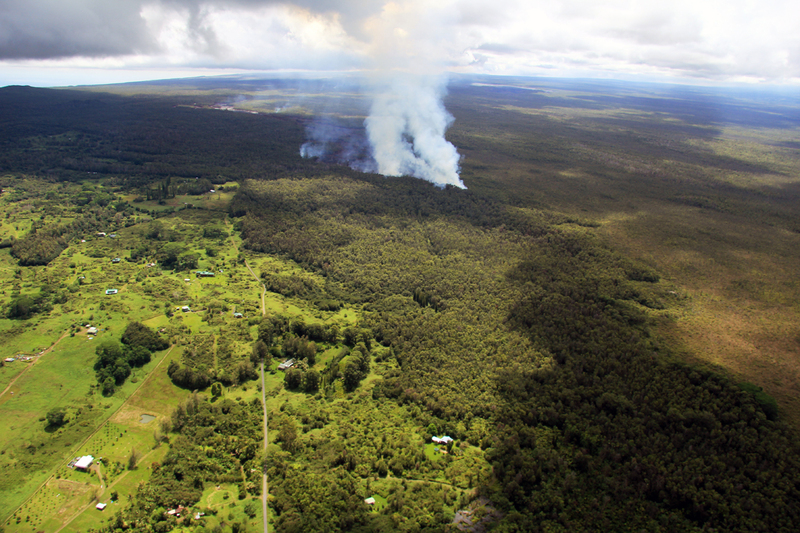 Wide shot of the flow front taken by USGS HVO, showing the lava moving through the forested northwest portion of the Kaohe subdivision. 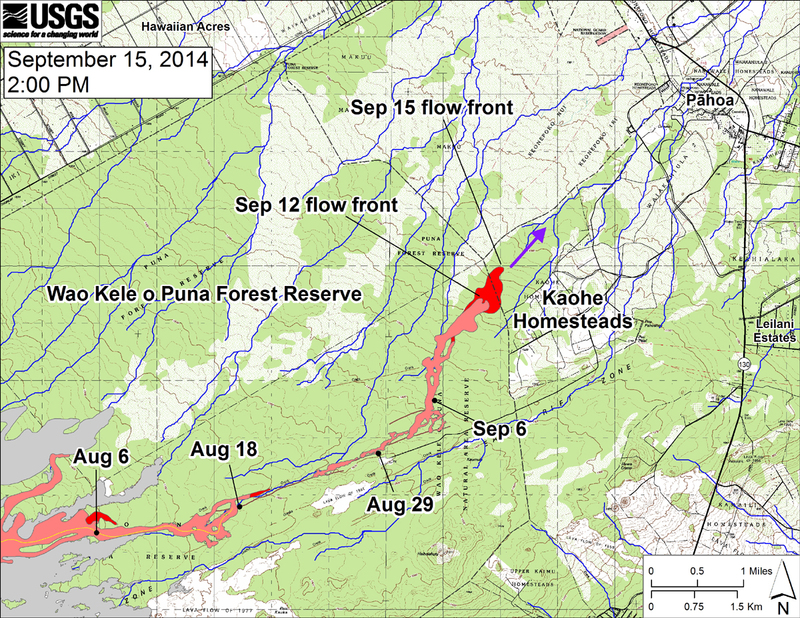 The flow front was 3.3 km (2.1 miles) upslope from Apaʻa Road and 4.3 km (2.7 miles) from Pāhoa Village Road. Another USGS HVO view of the flow front, in the northwest portion of Kaohe Homesteads subdivision.